The Aam Aadmi Party-led Delhi government will complete four years of governance on February 14 and the party is going all out to celebrate this feat. 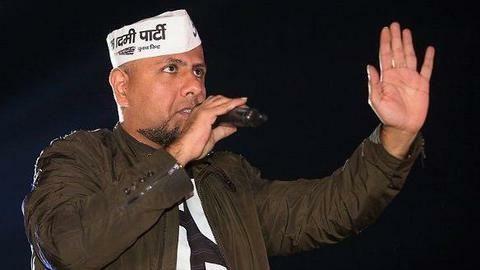 A concert by eminent music director and singer Vishal Dadlani, who quit AAP in 2016, has been organized at Indira Gandhi Indoor Stadium on February 12. Although entry to the event is free, guests will be allowed to enter on the first-come-first-serve basis. This is probably the first time Vishal is participating in an AAP event after his exit nearly three years ago. Vishal, who was one of AAP's biggest supporters in Bollywood, left the party after his tweets on Jain monk Tarun Sagar sparked a row. The 45-year-old artist had slammed the monk's address in Haryana Assembly and said religion should be kept out of politics. Vishal's tweets got him ire from many on social media. Though he apologized to Jain community saying he didn't intend to hurt anyone, the damage was done. Later Kejriwal reprimanded him and Vishal announced he is leaving AAP and politics. However, he maintained no one asked him to leave AAP and it was his decision. He even said AAP was his family. Separately, AAP released a video on Sunday featuring Delhi Chief Minister Arvind Kejriwal where he spoke about his government's achievements. Kejriwal said AAP worked towards fulfilling the dreams of our freedom fighters. From better government schools to tapped water and giving due to farmers and martyrs, the AAP government did all, said Kejriwal. He also 'congratulated' citizens of Delhi for getting an efficient government. As it turns out, the fourth-anniversary celebrations aren't restricted to Vishal's performance. The AAP government is also planning another mega event on February 14. Although details about the event are kept under wraps, reports claimed all party leaders will attend it and Kejriwal could announce important schemes. Delhi's pollution, bringing in electric buses and public transport are a few topics Kejriwal could speak on.